이번 주 소개할 것은 PBC 입니다. PBC에서 Cirrhosis가 Cholangitis로 이름이 바뀌었습니다. 가장 중요한 이유는 cirrhosis가 아닌 사람들이 있고, cholangitis라는 용어가 보다 병을 잘 설명하기 때문입니다. Editorial (Pratt DS. NEJM 2016)의 중요한 일부와 RCT (Nevens. NEJM 2016) 결과를 소개합니다. Primary biliary cholangitis, previously called primary biliary cirrhosis, is a cholestatic autoimmune liver disease that is marked by the progressive lymphocytic destruction of the smallest intralobular bile ducts. In the absence of effective therapy, it progresses inexorably to cirrhosis and liver failure. Ursodiol gained full FDA approval in 1997, supported by a pivotal placebo-controlled trial it showed the superiority of ursodiol over placebo with regard to important clinical end points, including death and the need for liver transplantation. Given these biochemical response criteria, it has been estimated that up to 40% of patients with primary biliary cholangitis do not have a response to ursodiol, are at risk for disease progression, and have a compelling need for additional therapies. This brings us to obeticholic acid, a farnesoid X receptor agonist that received accelerated FDA approval on May 27, 2016, for the treatment of adults with primary biliary cholangitis who have an inadequate response to ursodiol or who are unable to take ursodiol because of side effects. 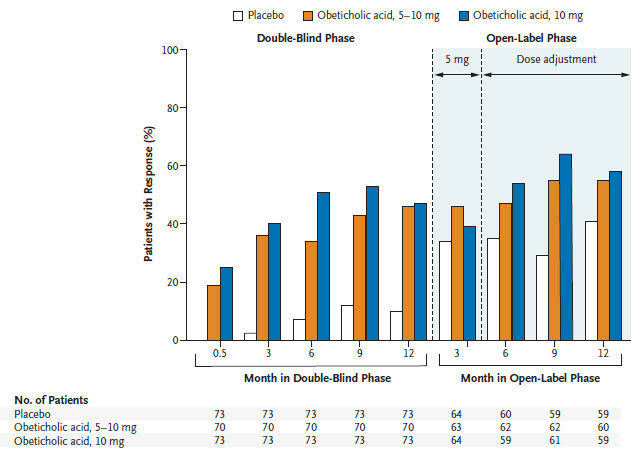 The results of a pivotal phase 3 trial of obeticholic acid (the PBC OCA International Study of Efficacy [POISE]), which are published in this issue of the Journal, were a key part of the application to the FDA. Patients were randomly assigned to one of three groups for a 12-month period: obeticholic acid, starting at a dose of 5 mg per day with adjustment to 10 mg per day at 3 months if the patient had an inadequate response (5-10-mg group), obeticholic acid at a dose of 10 mg a day (10-mg group), or placebo. The execution of clinical trials involving patients with primary biliary cholangitis is hindered by the rarity of the disease and its slowly progressive natural history. These limitations led a group of experts to conclude that the use of primary end points such as death and the need for liver transplantation is not feasible in clinical trials involving patients with primary biliary cholangitis. They recommended using biochemical markers of response that include bilirubin and alkaline phosphatase levels as primary end points, given the correlation of these markers with clinical outcomes in patients treated with ursodiol. A phase 3b study of clinical outcomes is under way with the primary objective of evaluating the effect of obeticholic acid on mortality and liver-related clinical outcomes.